Computer storage is measured in terms of bytes, kilobytes, megabytes and gigabytes. We use different units of storage depending on actual size range of the storage medium. Sometimes, we need to convert data figure among different storage units format. For example: conversion of data in bytes to kilobytes or to megabytes and gigabytes units. We can easily make such conversion using quick online and offline tools. Similarly, you can perform conversion of bytes into megabytes and gigabytee units online using Google Search website. 2. 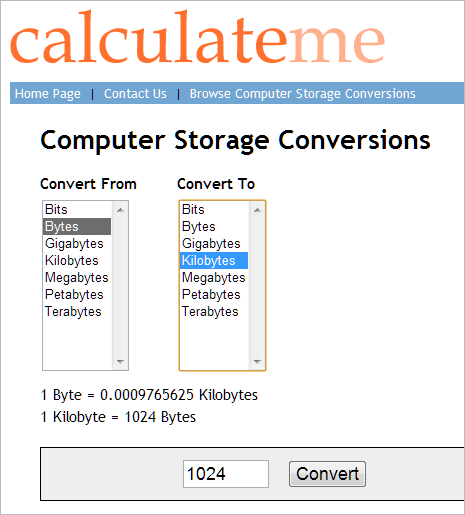 Online tools for conversion between bytes, kilobytes, megabytes and gigabytes are also available. Use online conversion tools like on Calculate Me website for quick conversion between different type of units of storage in few simple clicks. If you are not connected to internet all time, you can use offline alternative in the form of Bytes Converter tool. 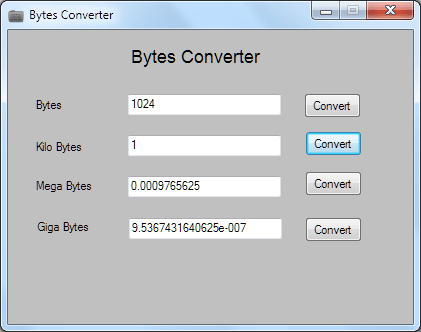 It is a free portable program for quick conversion between bytes, kilobytes, megabytes, gigabytes units. Once you download this program, double click to launch it. Enter number figure in any text box with specific units format and click Convert button to get required figure in respective storage unit formats.